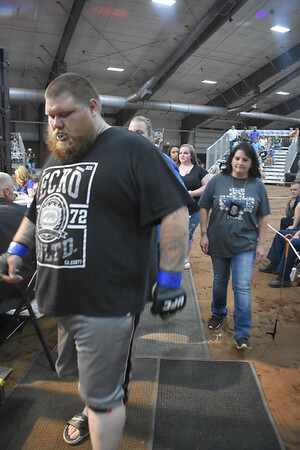 People were lined up outside the Grady County Fairgrounds Indoor Arena in anticipation of the Fists of Fury #17 Cage Fights on Saturday. Amateur and pro fighters ranging from 140 lbs to super heavyweights weighing over 300 lbs each battled out 10 rounds for an enthusiastic crowd. Fighters came from Grady County, all around Oklahoma and out of state.